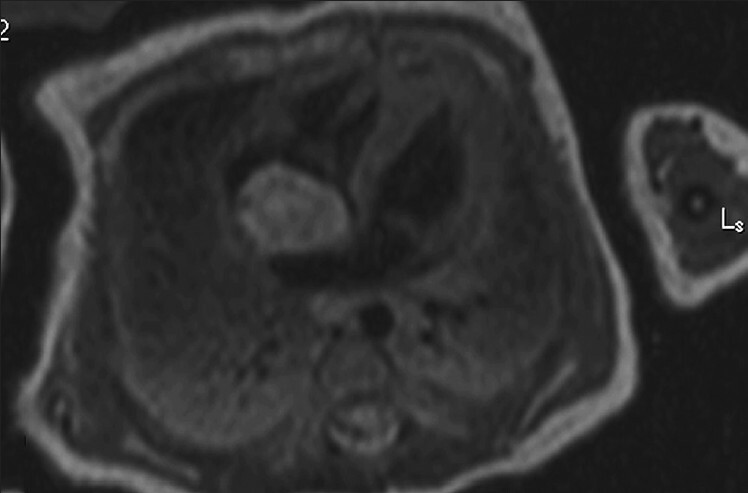 We present a rare primary right atrial tumor diagnosed in-utero with fetal echocardiography, and further characterized as a congenital hemangioma with magnetic resonance imaging. Surgical resection was done six days after birth. This case illustrates the complementary roles of evolving advanced imaging techniques for fetuses and infants with congenital heart disease that allows for surgery early in the neonatal period. Primary cardiac tumors are rare with an incidence of 0.0017% to 0.027% and are often benign in infants and children. With the advent of fetal echocardiography, more cardiac tumors are being diagnosed in the prenatal period. ,, While the overall incidence of fetal cardiac tumors in-utero remain unknown, a cardiac tumor was detected in 0.14% of pregnancies referred for fetal echocardiography at seven perinatal centers. The most common and studied primary cardiac tumor of infancy is rhabdomyoma (60%), which is often associated with tuberous sclerosis. Other less common childhood cardiac tumors include extracardiac teratomas (25%), intramyocardial fibromas (12%) and intracavitary vascular tumors or hemangiomas. More aggressive or malignant tumors such as hemangioendothelioma are extremely rare. We report a cardiac tumor diagnosed during fetal echocardiography and characterized as haemangioma by fetal magnetic resonance imaging (MRI). A 31-year-old primigravida was referred for prenatal assessment at 37-weeks gestation due to concerns for hydrops fetalis. Her antenatal history was unremarkable. Fetal echocardiography [Figure 1]a demonstrated a 16 × 19 mm intracardiac right atrial mass without hemodynamic compromise. The great vessels were normally related, cardiac chamber dimensions were normal and there was no pericardial effusion or evidence of fetal hydrops. After counseling, the family decided to deliver at a tertiary care center. Labor was induced at 38 weeks and delivery was complicated by prolonged rupture of membranes. The newborn was 3015 grams with Apgar scores of nine and nine at one and five minutes, respectively. He was transferred to the neonatal intensive care unit where routine neonatal care was instituted. Preoperative cardiac imaging included a transthoracic echocardiogram [Figure 1]b and MRI [Figure 2]. There was a 19 × 14 × 14 mm-right atrial tumor with a broad base of attachment arising from the inferiomedial wall of the right atrium interposed between the inferior vena cava and tricuspid valve. There was otherwise normal intracardiac anatomy without shunting and no evidence of pericardial effusion. The patient remained hemodynamically stable and was taken for elective resection on day six of life. A median sternotomy was performed and cardiopulmonary bypass was initiated with ascending aortic and bicaval cannulation, followed by aortic cross-clamp and cardioplegic arrest. Once the right atrium was opened and there was conformation that the tumor did not invade the left atrium, a left atrial vent was placed via the right superior pulmonary vein. The tumor was located between the coronary sinus, inferior vena cava, and foramen ovale with a portion attached to the right atrial free wall just above the inferior vena cava [Figure 3]a. The 2 × 2 cm tumor [Figure 3]b was sharply resected removing a portion of the right atrial wall and staying clear of the coronary sinus. The resected right atrium was replaced with autologous pericardium. Intra-operative transophageal echocardiography demonstrated a competent tricuspid valve and unrestricted flow in the right atrium. The patient was in sinus rhythm, weaned off cardiopulmonary bypass and extubated within 12 hours. The pathologic examination was consistent with a cellular capillary hemangioma with focal calcifications. The tumor was strongly immunoreactive for anti-CD34 and actin. With the advent of fetal echocardiography and prenatal diagnosis of congenital heart disease (CHD), there has been tremendous progress with regards to the perinatal management and outcomes for neonates and infants with CHD. Despite cardiac tumors being an extremely rare cause of non-immune hydrops fetalis, fetal echocardiography is especially important in fetuses with hydrops as cardiac tumors often lead to generalized edema, ascites and pleural and pericardial effusions. Careful fetal assessment can distinguish certain types of cardiac tumors allowing preparation and potential intervention, as many of these tumors can be pathologically benign yet clinically manifest as malignant even in-utero. Some of these findings include: rhythm disturbances, intra-cardiac masses leading to obstruction and/or compromise, extra-cardiac masses and secondary effusions leading to tamponade and or fetal hydrops. Through fetal echocardiography one can gain insight into altered fetal pathophysiology that can occur during development, which will allow for potential fetal intervention or preparation for postnatal intervention. Furthermore, perinatal counseling is improved by the diagnosis of other associated congenital diseases such as tuberous sclerosis in the case of cardiac rhabdomyoma. Several different vascular tumors, often termed "hemangiomas" have historically been classified together despite their differing histology, onset or age of presentation, and subsequent clinical course. Mackie et al. has concluded that subsets of infants and children presenting at various ages had similar clinical and histologic features as well as response to therapy. They defined congenital hemangiomas as those diagnosed in the prenatal period, infantile hemangiomas as those diagnosed within the first year of life, and hemangioma, hemangioendothelioma or hamartomas as those diagnosed after the first year of life. Congenital cardiac hemangiomas are rare benign tumors that are often asymptomatic in-utero but have been reported to cause hydrops fetalis and interuterine fetal death as early as the second trimester. In the immediate postnatal period, these infants may present with cardiac tamponade, syncope, congestive heart failure or cardiac arrhythmias and sudden death if the tumor is located in the ventricular septum. With early diagnosis and resection, prognosis is excellent. Ultimately, pathologic diagnosis was obtained based on the vascularity of the tumor, number of mitotic figures and immunoreactivity. Although benign proliferations of endothelial cells in various stages often have a consistent mixed echocardiographic appearance, careful image analysis beginning in the pre-natal period can distinguish various types of cardiac tumors. The use of fetal echocardiography and MRI will allow for optimization of care creating opportunities for fetal intervention and coordinating delivery and post-natal care at centers that can provide specialized care including early surgery for neonates and infants with CHD. 1. Nadas AS, Ellison RC. Cardiac tumors in infancy. Am J Cardiol 1968;21:363-6. 2. Hou CF, Chao A, Wang CJ, Chao AS, Hsueh C. Atrial hemangioma: A rare cause of hydrops fetalis and intrauterine fetal death. Eur J Obstet Gynecol Reprod Biol 2007;130:271-2. 3. Holley DG, Martin GR, Brenner JI, Fyfe DA, Huhta JC, Kleinman CS, et al. Diagnosis and management of fetal cardiac tumors: A multicenter experience and review of published reports. J Am Coll Cardiol 1995;26:516-20. 4. Ikemba CM, Eidem BW, Dimas VV, O'Day MP, Fraser CD Jr. Fetal rhabdomyoma causing postnatal critical left ventricualr outflow tract obstruction. Ann Thorac Surg 2005;80:1529. 5. Isaacs H Jr. Fetal hydrops associated with tumors. Am J Perinatol 2008:25:43-68. 6. Turan S, Turan OM, Maisel P, Gaskin P, Harman CR, Baschat AA. Three-dimensional sonography in the prenatal diagnosis of aortic arch abnormalities. J Clin Ultrasound 2009:37: 253-7. 7. Tworetzky W, Marshall AC. Balloon valvuloplasty for congenital heart disease in the fetus. Clin Perinatol 2003:30:541-50. 8. Su ZK, Chen E. Fetal cardiac surgery-a big challenge in the 21 st century. World J Pediatr 2008:4:5-7. 9. Kiaffas MG, Powell AJ, Geva T. Magnetic resonance imaging evaluation of cardiac tumor characteristics in infants and children. Am J Cardiol 2002:89:1229-33. 10. Mackie AS, Kozakewich HP, Geva T, Perez-Atayde AR, Mulliken JB. Vascular tumors of the heart in infants and children: case series and review of the literature. Pediatr Cardiol 2005:26:344-9. Hornung, M., Bertog, S.C., Franke, J., (...), Hofmann, I., Sievert, H.